CODEPINK and #Occupy Rally for Bradley Manning at Fort Meade! On the morning of Saturday, December 17th, 2011 I arrived at Occupy DC in McPherson Square, bundled up, bracing myself for the cold day ahead. Right away I found Mel, CODEPINK staffer from the NYC office, and we excitedly rejoiced at being reunited. Shortly afterwards we boarded the bus chartered by Occupy Wall Street occupiers from NYC, and behind 2 other buses from the Washington DC occupations we took off for Fort Meade to rally outside of Bradley Manning's pretrial hearing. It was a fun bus ride, mingling with occupiers from Zuccotti Park and chatting with Dan Choi, gay rights activist and hero. We handed out Bradley Manning buttons and whistles and talked about the pre-trial and the fate of the brave Bradley Manning. Upon arrival at Fort Meade, we were greeted by hundreds of activists already lined up in front of the gate, ready to march along the roadside. We rallied for a while, chanting "Free Bradley Manning!" and "Whistleblowing's not a crime, Bradley shouldn't be doin' time!" There were hundreds of bright orange flags with Bradley's face stenciled on them, and many signs which read FREE BRADLEY. 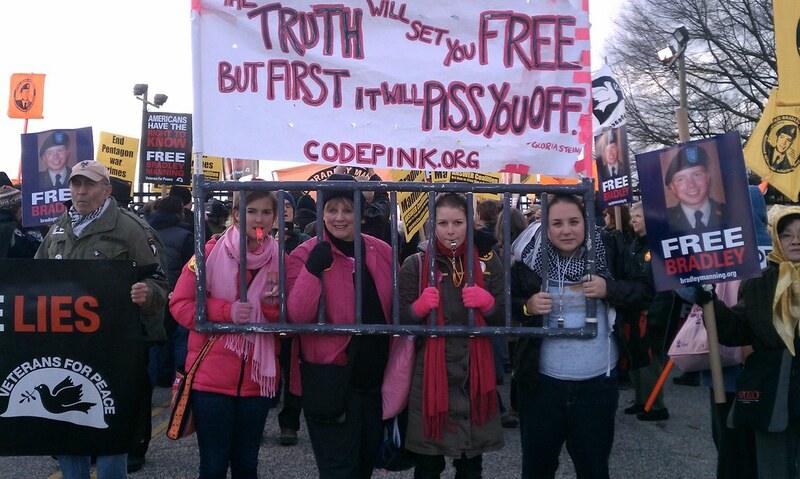 The CODEPINK contingent had an awesome prop of "jailbars" supporting a large sign with the Gloria Steinem quote: "The truth will set you free, but first it will piss you off!" Carrying the jailbars with me were Mel from Occupy Wall Street and Kira from Occupy Baltimore. “Occupy DC, Occupy Wall Street and Occupy Baltimore are in the house – the jailhouse!” we joked as we marched. All of us trekked about one mile down the road, rallied and heard from incredible whistleblowers such as Ann Wright, Ray McGovern, and outspoken activist Lt. Dan Choi. Cold and hungry but energized and upbeat we walked the mile back to where our buses were waiting for the return trips home. It was an incredible day of solidarity; people from all different occupations attended to support Bradley Manning because they understand the risk he took in allegedly exposing the truth about what our government is doing in other countries – risks to which the Occupy movement and democratic movements around the world owe a huge debt. You Don't Seem to Care About the NSA Reading Your Emails. But You Probably Should.